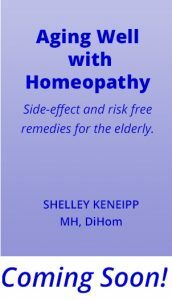 The Parent’s Guide to Homeopathy: Safe, Natural Remedies For Children, From Newborns Through Teens, North Atlantic Books, 2015 is a user friendly book spanning from newborns through the teen years. Parents will be able to use this book for just about any acute ailment that arises. This book addresses over 150 acute conditions. The section on winter ailments, first-aid, and travel can be used for the whole family. If a child wakes up in the middle of the night with an earache or develops an upset stomach while traveling, parents will have a storehouse of knowledge at their fingertips in this book.